Twenty years ago England went into the sixth and final Test at The Oval with nothing but pride to restore. Allan Border's Australia had already won the Ashes 4-0. Graham Gooch, at 40, decided to step down from the captaincy after the defeat in the fourth Test, in Leeds. Ted Dexter, the chairman of selectors, had announced he was resigning too, but as his final decision he picked 25-year-old Lancastrian Mike Atherton to lead. Graham Thorpe broke a bone in the finger, an hour before the toss, facing a net bowler. Mark Ramprakash, playing for Middlesex at Lord's, was summoned immediately. England's fast bowling attack, Devon Malcolm, Angus Fraser and Steve Watkin, were playing together for the first time, and in their first match of the series. Yet these three, along with a bold captain, made it a victory to savour. Michael Atherton Thorpe had come into the team that summer and done well, so his injury was a blow. As for the fast start: a quick pitch, and both of us [Gooch and Atherton] being in decent form, accounted for that, rather than a preordained plan. However, as a new captain, I wanted to try and play in a positive manner. Watkin was preferred to Phil Tufnell, given the pitch. Martin Bicknell had pulled out the previous day due to an injury. Fraser had played just a couple of games before the Test, having returned to active cricket from a hip injury that had kept him out for two and a half years. He had been picked at the behest of Dexter, who had seen him take seven wickets in the county match between Middlesex and Leicestershire. Angus Fraser Devon and I bowled quite well together. He was quick, hostile. Big strong man, got away swing. When he got it right, he was very dangerous. He wasn't the most consistent bowler and always bowled the odd bad ball. We complemented each other. If Devon was bowling, then for a batsman I might have been a more attractive proposition to look to score runs against, but my accuracy meant you were taking a risk. Steve Watkin was a fine bowler. Similar bowler to myself: accurate, nagging, bowled a good line, swung it if the conditions were right. It was a white pitch at The Oval, had some pace in it. Steve Watkin I had been the leading wicket-taker in the country that year, with Glamorgan going well that season. I had been in the squad from the Edgbaston Test and was obviously disappointed not to play there. But I got my chance in the final Test and was excited, despite England being 4-0 down. We had never played together, but I knew what my role would be: Malcolm was the paceman, while Fraser and myself were control bowlers. One reason Fraser and I had never played in the same Test was because people felt we were similar, but I always thought we were different in a number of respects: he was taller, I was probably little bit more quicker and had bit more variations, perhaps. But both of us knew if you bowled accurately you had more chances. The first-timers did not disappoint. Malcolm bowled quick and got rid of Michael Slater and David Boon, caught by Gooch, positioned as hip-pocket fielder. Fraser took his first wicket off his 17th delivery, over 31 months since his last Test victim, in Adelaide in December 1991. He would finish with a five-for. Australia just managed to avoid the follow-on, having been reduced to 196 for 8 late on the second afternoon. Fraser It was a big Test for me because on the 1990-91 tour of Australia I had injured my hip. Many people had forecast that as the end of not only my international career but my cricket. In the winter of 1992-93 I saw a hip specialist in Cambridge who performed an operation that got rid of the pain. Then all of sudden, at the back end of the summer, as England were getting beaten by Australia, Middlesex were having a good year. I got eight wickets against Leicestershire at Lord's in a match that Middlesex won. Then I went to Scarborough, where I took an eight-wicket match haul again, against Yorkshire. That is where I got the call to play again for England. I had some real low times, what felt like meaningless [training] sessions during the winter months when I was trying to get fitter and stronger. So to get back to the England side was very satisfying. And that first wicket, of Mark Waugh, probably meant as much to me as any wicket in my career, just because all the work was worthwhile. It was a good ball, bounced a bit, took the outside edge and Waugh was caught behind. I remember Mark Ramprakash produced a brilliant bit of fielding at cover point the previous delivery. Waugh had gone for a drive but Ramprakash dived and stopped the ball one-handed. I managed to get Steve Waugh with a good ball - a straight one bowled from close to the stumps. Allan Border tried to cut too close but could only edge to the wicketkeeper. Third morning I removed the final two Australian wickets to finish with a five-for, the fifth of my career. It was hugely satisfying. Devon Malcolm I bowled pretty quickly throughout. I got one ball to curve back into Mark [Taylor] and although he had a chest guard it hit him in the solar plexus. He was forced over and he was finding it hard to breathe and he was very uncomfortable. We bowled well as a unit. It was the first time for a while I bowled with Angus. When he bowled at the other end I could bowl a lot of outswingers, and even if I went for four an over he would go for two an over. 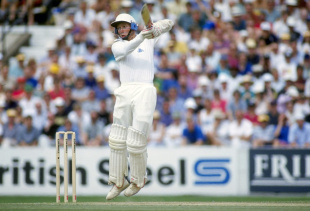 Atherton Ian Healy was a good player at No. 7, counter-punching and marshalling the tail. The context of the game was that England had lost eight or so of the previous nine Tests (hence the change of captain), so any good position was happily taken. Confidence was obviously low because of that. Malcolm We always had to get through Healy to win against Australia. He was such a dangerous player. He wasn't a pretty batsman but he would help the lower order get in the right frame of mind, and in no time he would put on a big partnership with the tail. I tried everything but he stood strong. Watkin We always talk about winning the first innings. If you do that, you control the game. And we controlled that match from the first day, with Gooch and Hick getting runs. England were once again given a bold start by their openers. Gooch changed gears once Atherton departed, stayed solid, and went past David Gower to become England's highest run-getter in Tests. England set Australia a tall target of 391 in 123 overs. Atherton Australia's advantage in the previous Tests had been based around spin fundamentally, Warne and May. This Oval pitch offered the spinners nothing except bounce. Like a Perth pitch (where Warne has rarely done well), not like the modern Oval pitches which turn. Seven batsmen was a short-term measure, really, because of how things were going, and we got lucky that the pitch was responsive to the quicker bowlers. Rain curtailed play on the fourth evening. The final morning started well for England. Watkin I remember bowling a ball early in the morning which had come out of my hand wrong and landed sort of in the covers and it stopped dead. Normally a batsman would let it go and throw the ball back to bowl the next delivery. But Slater came down and hit the ball for a four. Ironically a couple of balls later he got something on a ball, which went through to the wicketkeeper and was given out. It seemed the ball had hit his arm guard. Funny how the cricketing gods work! I got Boon lbw next ball and it put me on a hat-trick. But Mark Waugh defended a reasonably straight ball. I was quite pleased to get four wickets after I got Mark Taylor bowled. My final wicket was Ian Healy, who went after a good bouncer. He top-edged and Mathew Maynard, my Glamorgan colleague, at second slip ran back and caught him near third man. That was the second catch he had got in the game off me, and that was really another good moment. Malcolm We were staying at the Hilton in Chelsea and I was driving to the ground, but there was an incident at Vauxhall Bridge and it took absolutely ages to move in the traffic. I had to abandon my car and run to the ground to try and get in on time so we could start the game. I arrived all sweaty in the dressing room. Australia needed 300 in the final two sessions. 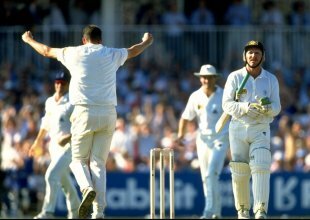 They were 148 for 8 at tea, but Steve Waugh and Merv Hughes dug in. Malcolm removed them with another aggressive burst of fast bowling, but Paul Reiffel and Warne put up more staunch resistance with a 74-run partnership for the ninth wicket. Malcolm I remember hitting Reiffel on the head with his second ball, and that shook him up, but he stayed put and frustrated us. But we three were a good bowling unit and even if Australia had a few partnerships, we were always confident. Fraser I got three of the last four wickets. Hughes went for the slog off a length ball, top-edged and was caught at long leg. Reiffel pushed one back to me for a return catch. Then I trapped Warne lbw in front as the final wicket. I don't think we feared they were going to get there. At 5.18 pm England won. It had been 2430 days, 11 hours, 49 minutes, as one newspaper noted, since England's last Test win against Australia in Melbourne, in December 1986. Fraser I was absolutely chuffed. I won a bottle of champagne and a few quid, which ended in the players' pool. Having been through what I had gone through and then to stand there on the balcony with the Man-of-the-Match medal was amazing. A week later Middlesex went to play Essex. We beat them to win the Championship. Having sort of struggled to take wickets, I finished with 32 wickets in four matches, including the Oval Test, with eight in each of those games. Watkin It would have been nice to get a five-for, considering I had got four of the first six wickets. I had a couple of chances to get there when Warne hit one down to third man, dropped short, and then he hit one over the top of cover. It was my third Test match. Of the other two we had won one and drawn the other, so I had won two out of three. Also, it was the first time two Glamorgan players had been in a Test match together. Glamorgan won the Sunday League that season and finished third in the Championship. Atherton We were obviously delighted, given the context which had seen us lose a lot of Tests recently and given our inability to beat Australia for some time. Naturally, given that it was my second match as captain I was delighted. Relief, I suppose more than anything.